Burgers have been very in vogue in Lisbon for some time now, and “Prego” is definitely the Portuguese version of a burger. It’s not made with minced meat, instead, it’s with a beef steak. Or in the case of Peixaria, a Portuguese word which stands for Fish Shop, some burgers are also made with Cod, Tuna or shrimp and squid, all served in different types of bread, like carob or Madeira’s traditional flat bread “Bolo do Caco”. 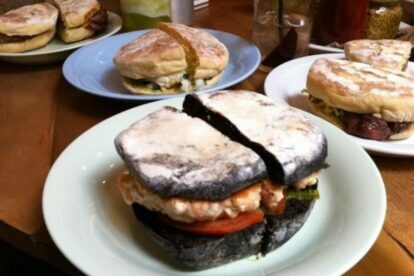 Their latest addition is crab burger, really delicious! The moment you are inside O Prego, eating one of their many curious and delicious burgers and pregos, it’s impossible not to notice every detail of the restaurant. The wall of “ancient doors”, and a giant Lisbon graffiti on the opposite wall, advertising Alvalade neighborhood highlights. On the center there is a nice squared balcony bar with an Olive Tree in the middle. Yes, a real Olive tree. Also and curiously the first room is themed as a classroom. I guess it’s because the proximity with the State office of Education nearby. All in all, a perfect experience of food, restaurant and neighborhood. And do try their juices. Hard to choose but always good.